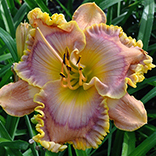 ORANGE CITY (Dan Trimmer) Tetraploid ((Lucky Dragon x Seedling) X (Jane Trimmer)) 29” EM Re. Ev. 4 ¾” ORANGE CITY is boldly shocking, off the color charts and is the type of flower for which I believe I’ve have become known; bold color, upon bold color! For generations ORANGE CITY, just north of our home in Enterprise sent Florida oranges to points north. We offer you this bold orange, crimson eyed beauty so you can bring the tropics home! Even though my goal for quite a few years has been to make flowers more fancy, color is still the number one name of the game for me. Tall scapes, typically having 3 laterals and 25 buds produce a striking garden showoff. 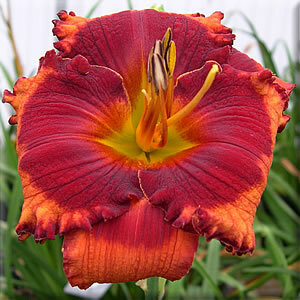 Fertile both ways, please see an exceedingly fertile ORANGE CITY seedling on the back page, of this catalog.